Muslims must not suppress the concept of death from their lives. On the contrary, they are asked to live with death. Death is people’s daily companion and for the sake of living, people must become aware of this. The Qur’an says: “Wheresoever ye may be, death will overtake you, even though ye were in lofty towers. (4:78) or, “Lo! the death from which ye shrink will surely meet you” (62:8) and finally: “We mete out death among you, and We are not to be outrun. That We may transfigure you and make you what ye know not.” (56: 60-61). If we want to understand the Muslims’ certainty, which is focused on the day of Resurrection and an eternal life near God, we must understand some of the liveliness of the tradition. In connection with the eschatological events the Angel of Death (tradition gives him the name “Izra’il”) plays a dominant role. He is spoken of in sura 32:11: „Say, ‚The Angel of Death put in charge of youwill recleim you, and then you will be brought back to your Lord.‘” Although the Qur’an does not elaborate on what happens between Death and Resurrection, the tradition has talked about this topic comprehensively. Accordingly, the angel of death has the task to separate the soul (‘nafs’ or ‘ruh’) from the body of the dead. If it is among the saved it will be led to God where it hears that all its sins have been forgiven. The soul then returns to earth and settles at the head of the not yet buried body. The soul of a lost person, however, is rejected already at the lowest gate of Heaven. The angel of death then removes his protecting hand from it and it falls back on earth. There it is overpowered by the Zabaniya, the angels guarding hell, who take it to the assembly of the damned. A second important station is the questioning in the grave. Once the body of the dead person has been buried the angels Munkar (the Denied) and Nakir (the Denier) appear to ask the dead person about his faith and his life of faith. This narrative has resulted in a very moving tradition that plays a major role at funerals. Those assembled attempt to help the dead person and to prepare him for the angels’ questioning. They call out the following words: O servant fo God! Recall to mind the obligation which you have accepted before leaving this earth: the knowledge that there is no godhead but the One God and the Muhammad is the messenger of the One God that the belief in paradise is true, that the belief in hell is truth and that the questioning in the grave is truth, that there is no doubt that the Last Day will come, when God will raise those in the graves; that you have professed that God is our Lord, the Qur’an your guide, the Ka’aba the direction, in which you recite your prayer and that all the believers are your brothers and sisters. God may strengthen you in this trial; because the Qur’an states: “God will give firmness to those who believe in the firmly rooted word, both in this world and in the Hereafter, but the evildoers he leaves to stray: God does whatever He will.” (14:27). If this is the final answer the angels Mubashshar aund Bashir (bringers of good news) take care of the dead person. They open the grave a little so that the incoming light streams onto the questioned person as a sign of the promised Resurrection. Then they say: Sleep, as the bridegroom sleeps whom only his beloved may awake. Rest until God raises you from your bed. If the answer is negative, however, the dead body is given so-called punishments of the grave, i.e. he is beaten and humiliated by Munkar and Nakir. Then follows the long night, the waiting time for the final judgment. The souls live as if in drunken sleep. When finally the Last Day begins, it will appear to them “as though they had tarried but an hour of the day” (10:45) or “but tarried for an evening or the morn thereof” (79:46). Of course, the tradition of this non-Qur’an based theology has always been contested, although it is a firm part of public piety. In particular the reason-based theological strand of the Mu’tazilites in the first half of the 8th century, to which also the reformer Muhammad Abduh 1849-1905 subscribed, rejected the idea of a questioning in the grave and therefore also the punishment in the grave. The Mu’tazilites argue: Looking at the dead there is no sign or evidence of a Resurrection and of a questioning. This, however, is against the literal interpretation of the verses cited, which appear to be about a punishment in the grave. Because the literal meaning of the Qur’an can only be assumed if it does not contradict experience and reason. Otherwise, it must be interpreted figuratively. What is required is the belief that every person will have to justify themselves before God and that a judgement about this justification will result in either reward or punishment. There are also different narratives regarding the location of the soul between death and resurrection. According to one of these texts the soul resides in the grave until the resurrection. This is your place until the day of the resurrection, when God will wake you. Here it receives according to what it deserves, reward or punishment as a foretaste of what awaits it after the resurrection on the Day of Judgement. Another text reports that all believers go to Paradise even before the judgement: The soul of the believer is like a bird that dwells in the trees of Paradise until God awakes it on the day of the Resurrection of its body. The Mu‘taziliten, on the other hand, point to the teachings of several companions of the prophet Mohammed and their successors, who restricted themselves to the following statement regarding eschatological questions: „The souls of the faithful are with God“, without addition anything else. So much for the tradition. Whatever one may think about the pious tradition, it must be said that the texts exude a highest level of certainty that people will meet God, that the boundary of death does not apply to God and that death is not the end but a new beginning. 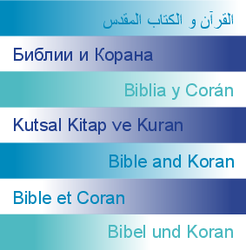 In spite of the colourful images of Paradise, which according to sura 47:16 must be understood as parable, the Qur’an is rather dry and sober, almost silent about the meeting with God, as if it wanted to demonstrate that the overcoming of death through God’s power and mercy does not require any words or special pointers. People can imagine joy and suffering only in the context of their personal experience of life and their particular envionment. Muhammad Hamidullah writes that the form and content of statements about paradise and hell were naturally aimed at the expectations and imagination of contemporaries of the Prophet Mohammed and that they referred to situations found in those times and environments. They use concrete imagery of what surrounds us in our earthly life: Gardens and streams, young beautiful women, carpets, precious stones, fruit, wine and everything else people can wish for. By the same token, what is found in hell is fire, snakes, boiling water and other tortures; also ice covered deserts - and yet (!!) no death. Even if those images are no longer appropriate for our times, we can sense the strong intensity, which tries to convey something that is not intended for logical, rational processing but for the world of emotions. And yet the purpose remains obvious: We are dealing with an image as an aid to firming up our moral, ethical and social behaviour. The prophet says, for example: “If death comes to a believer this is for him the good news of God’s pleasure and of his mercy. He loves nothing more than that which is about to occur. He yearns for a meeting with God and God yearns for a meeting with him. An unbeliever, on the other hand, recognises the news as a notification that announces God’s displeasure and the impending punishment. He hates nothing more than that which is about to occur. The thought of an encounter with God is an embarrassment to him and God, too, is embarrassed by the expectation of this encounter. The residents of hell will grow there so tall that the distance between their ear lobes and their shoulders will be like a 700 year long journey, their skin like 70 cubits and their back teeth will be like mount Uhud“ (Ibn Omar according to Musnad Ahmad). And finally, the narratives speak of those inhabiting paradise: “The most humble position of one of you in Paradise will be that God shall tell him that he may make a wish. And he will pronounce many wishes... and finally God will tell him that all his wishes shall be fulfilled. He will receive everything and an equal amount on top “ (Abu Huraira and Muslim). Of the damned, however, it is said in sura 2:174 that: “Allah will not speak to them on the Day of Resurrection”, and in sura 3:77: “Allah will neither speak to them nor look upon them on the Day of Resurrection”, “ but surely on that day they will be covered from (the mercy of) their Lord. (83:15). But this expulsion is not forever. Mohammed said: “Over hell there will come the day on which its gates will rattle (against each other) in the wind and there will be no-one left inside” (Abd Allah ibn Amr Ibn al-As according to Musnad Ahmad). There are people who die in old age after a fulfilled life. But there are also children and young people who die from illness, hunger or cold, in accidents or disasters. Only God knows how many people die because of the indifference of their neighbours who want to share neither bread nor medicines, neither their land nor their houses; or because of the violence of those who prefer to wage war to fighting for peace. *	When Christians say that they believe in the Resurrection of the dead and in eternal life this does not mean that they want to avoid death and suffering. *	They are only interested in comforting their disadvantaged and excluded neighbours with words of a better life after death. *	When Christians say that they believe in the Resurrection of the dead and in eternal they want to say: “We firmly believe and hope with confidence that just as Christ is truly risen from the dead and lives for ever, so after death the righteous will live for ever with the risen Christ and he will raise them up on the last day (CCC 989). We believe that we are called to live with our whole transformed being a much better life than everything we can imagine or dream about, because it shall be given to us by God. The books of the Bible are full of stories. In it, people speak of their plans and aims. Of their joys, when life is good. Of their sadness and disappointment when misfortune strikes. Of the evil they do and the evil they suffer. They ask: Why are we on this earth? What is all this effort good for when every person knows that they will have to die? Why is the one granted a long life while the other dies before their life has even properly begun? People cannot find valid answers to those questions from within their own experience. The people whose stories we read in the bible know their own limits. And yet they experience a hope that exceeds those limits. They sense that they are open to God. They place all their hope in him. The one who believes in me will live, even though they die”. How will the dead rise again? Our language, our words refer to this world and its reality. We do not have words for God’s world and reality. The early Christians already made this experience when they asked: How shall the Resurrection of the dead be accomplished? What will happen to the body that decays in the grave? Does a disabled person remain disabled after their resurrection? Will a child who died become an adult in Heaven? What about all those who died and are yet to die in the hope in God and in the belief in Jesus Christ? Faced with all these questions, and many others, we have no better answer than to look to the resurrected Jesus, who is glorified and who also bears on his body the wounds of his passion as a sign of the great love that caused him to give his life for us. The empty toomb, the stigmata on the one hand and the new and mysterious appearance of the resurrected Jesus on the other enable us to say that the dead will arise with their bodies, which is at the same time different, because it is glorified, just like the grain of wheat that falls into the ground is transformed in death to bear fruit (cf. John 12:24). What is "rising"? In death, the separation of the soul from the body, the human body decays and the soul goes to meet God, while awaiting its reunion with its glorified body. God, in his almighty power, will definitively grant incorruptible life to our bodies by reuniting them with our souls, through the power of Jesus' Resurrection. When we participate in the Eucharist we feed our body with the body of the resurrected Lord. The Eucharist is a pledge of eternal life. “Yet our participation in the Eucharist already gives us a foretaste of Christ's transfiguration of our bodies:” (CCC 1000). "Whoever eats my flesh and drinks my blood has eternal life, and I will raise him up at the last day. The body [is meant] for the Lord, and the Lord for the body. And God raised the Lord and will also raise us up by his power. Do you not know that your bodies are members of Christ? . . . You are not your own; . . . So glorify God in your body. Death scares people - even those who trust in God. Because death means saying goodbye, parting and separation. Everything life made a person become, all wealth and all people must be left. Everyone dies their own death with empty hands. No dying person should be ashamed of their fear. Jesus, too, called for his father on the cross. Together with him every dying person can call for God when their last hour is near. Just like the robber crucified together with Jesus who places all his trust in his saviour and who is told: “Truly, I say to you, today you will be with me in Paradise.” (Luke 23:43) With Jesus every dying person can be sure that the merciful God will turn all fear to joy and that he will fill the empty hands. “For those who die in Christ's grace it is a participation in the death of the Lord, so that they can also share his Resurrection.” (CCC 1006). We believe that God will meet us when we die. The eyes that have been closed by death will open. We stand before God, each one with our own story, our love and our guilt. Will all the good and evil we have done: for the love of God and our neighbour or to his detriment. We believe that this encounter will determine our lives. The prophets of Israel and Jesus talk of this experience as judgement. God’s eyes see deep into our souls. Nothing can be kept secret from him, nothing can be glossed over. He, who is endlessly just, knows that we are weak and it takes it into account. He, who is endlessly merciful, recognises whether we humbly admit our weakness and whether we expect everything from his mercy. And the judgement will be pronounced: Reward or punishment, bliss or damnation, Abraham's bosom or eternal flames, songs of praise or weeping and gnashing of teeth (cf. Matthew 8:12), dance at the wedding or useless knocking on locked doors (cf. Matthew 25:1-13). These are images that touch us deeply. They are said to those who are still travelling so they can repent, change their lives and become stronger in the love of Christ: in faith, in hope and in love. an everlasting dwelling place is made ready for us in heaven. Death: Marks the end of earthly life and the beginning of eternal life: The soul is separated from the mortal body. It encounters God in a special judgement. On the Last Day, when Jesus comes again in glory, all the dead shall rise again, their souls shall be reunited with their bodies, those of the just with a transfigured, glorified body and those of the damned with a body full of pain and suffering. Day of judgement: We differentiate between the individual judgement or the judgement of the individual person and the final Day of Judgement. The individual judgement follows immediately upon death. It determines the eternal membership of the communion of the chosen or the eternal exclusion from this communion. The judgement is made according to the extent every individual has tried to follow God’s will during his earthly life and to believe in Jesus Christ. This judgement is final. The Day of Judgement (judgement of the world) is connected with the Last Day, the day Jesus Christ comes again to reveal God’ kingdom that is also his kingdom. On this day all the dead shall rise again. In the presence of all the nations called together before Christ every individual shall be judged, body and soul (cf. Matthew 25:32). Judgement: The verdict will be based on a person’s free will during their earthly life. Those who have separated themselves from God, deliberately and voluntarily, have no place among the chosen. Their fate is that of the excluded, “in everlasting fire, prepared for the devil and his angels” (Matthew 25:41): this is “hell”. For those who proclaim God and Christ his son, but who at the time of their death are not yet fully ready and worthy to meet him, a period of clearing, of waiting and maturing is planned in “purgatory”, the purging fire. There they wait in the hope of their entry into the fullness of communion with God. They are helped by the prayers of the faithful. To the select who allowed themselves to be consumed and transformed by Christ’s love, the following words of Jesus apply: ‘Come, you who are blessed by my Father; take your inheritance, the kingdom prepared for you since the creation of the world.” (Matthew 25:34) They see God as he is and they are are similar to him. (cf. John 3:2). They live in everlasting communion with him. They are “in heaven”. No longer to be scared of anyone, not even of ones own weakness; to be that person God had in mind when he called us by our name; to live with God; to live in the fullness, forever, not in an eternal rest but in an unimaginable fullness of peace, light and love - who could say precisely what this will be like? we shall love and give thanks. See, this is what shall happen and it shall have no end. The prophets of Israel and St. John, the Christian doomsday prophet, speak in metaphors to explain what the new life will be like. They speak of heaven not as if it were some place somewhere above the clouds. Heaven is where God is and where people live with him as his peoples. The old earth, full of guilt and defaced by people, has gone. A new earth will be the humanity’s home, an earth that shall be as God wanted it to be, illuminated by the risen Christ. A world in which people, his people, live with him and delight in the vision of God: He himself is their light and their life. Therefore the sun and the moon will not longer be needed. In the New Jerusalem there are no houses made of stone and no temples in which to meet God. God is present, he dwells among the people. There will be a new fruitful earth for which the bible contains numerous images: Springs burst forth from the deserts; trees grow and bear fruit twelve times a year. A world in which no creature threatens another: Wolves lie with lambs; they can live without threatening each other. A baby puts his hands into a snake’s den and is not bitten (cf. Isaiah 11:6-8). People discover that it means to be human in its fullest form and integrity. There will be no more illness, no death, no loneliness, no sadness, no tears, no hatred, no enmity, no oppression. There are other images too, because there are barely enough words to describe this fullness: The eyes of the blind are opened, the ears of the deaf are opened, the lame jumps like a deer and the tongue of the mute sings with joy (cf. Isaiah 35:5-6). Swords and spears become unnecessary; they are broken up to be turned into ploughshares and sickles. There are no more thoughts of war. Everyone can sit underneath his vine or his fig tree without having to be afraid of anyone else (cf. Micah 4:3-4). God himself will wipe the last tears from the eyes of the sorrowful - yes, everything that was is gone. St. John the visionary wrote the last book of the New Testament, the “Apocalypse”, also called Revelation. The revelation is of the secrets God has “revealed” to St John in visions: The triumph of God and of Christ his son and the defeat of the evil powers; everlasting salvation; the bliss of those who live with God forever. to bring unity to all things in heaven and on earth under Christ.